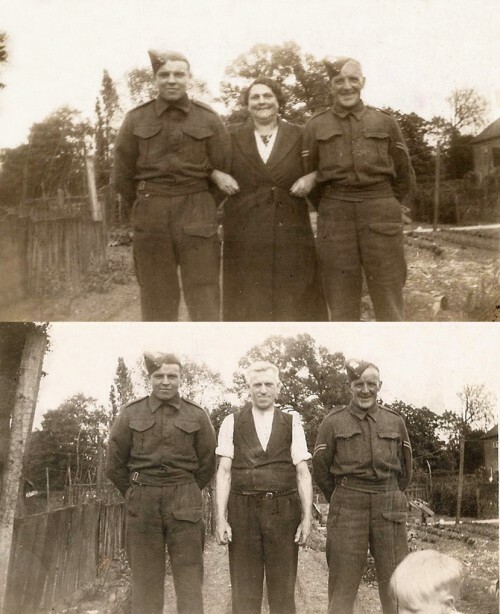 These two photographs were taken during WW2 in 1942, in the back garden of 7 Mansfield Street, the home of the Bumpus family. The first picture shows Louisa Bumpus with her son William (Billy) Bumpus (on the left) and his friend Jack Newton (on the right). The second picture includes Billy’s father, Allen Richard Bumpus. Jack lived at 18 Freehold Street. The boys had just returned from Norway, and Mr and Mrs Bumpus also did their bit by having young evacuees staying with the family.